SlugFest Games - Announcing SlugCrew Rewards for 2014! Greetings SlugCrew (and SlugFans interested in joining SlugCrew)! It’s about time we had an announcement about the new SlugCrew rewards for 2014! The response to the rewards program was great in 2013. People ran more demos of our games than ever before, and we feel that it made a real impact on exposure and sales of our products. So thank you! Let’s do that again! For those of you who are new to the SlugCrew Rewards Program, here’s the short version. If you sign up for SlugCrew and log your store and convention demos on our website, you will earn SlugCrew Points (typically 5 points per hour of work). When you earn 30 SlugCrew Points, you earn the current Minor Reward, and when you get to 150 SlugCrew Points, you earn the current Major Reward. These new character-themed drinks continue the idea we started with Witchdoctor Brew and Chieftain’s Ice Beer. Expect to see more such drinks over the next couple of years! Also, as an added bonus while supplies last: we have some of the 2013 SlugCrew Drinks left (the alternate versions of Gambler’s Grog, Monster Attack and Barroom Brawl). If you earn the 2014 drinks and we have the 2013 drinks left, we’ll throw them in! We expect the new promo drinks to ship sometime in March. This year’s Major Reward will be another RDI Ally: his name is Wrench, and he is a Kobold Artificer. Yep, you read that right. Kobold Artificer. Wrench’s actual name is, of course, unpronounceable by humans and most other races, so The Party gave him a nickname that stuck. So, how did Wrench meet The Party? Well, he was always interested in gadgets and engineering. Although there is evidence that that was common among kobolds thousands of years ago, it is quite rare now. Wrench, however, has spent his life studying the work of non-kobold beings, poring over their manuals and periodicals whenever he could. His research led him to the illustrious works of Wizgille, and he decided that he had to meet her and see more of her work. Wrench needed a bit of persistence to accomplish this; Wizgille doesn’t love fanboys, after all. But eventually he impressed Wizgille and the others enough that he started getting invited along on certain adventures, where his gadgets have proven useful. His deck is one of the most fun decks we’ve designed in a while. Most of Wrench’s Action Cards are gizmos that he lays out on the table. You can end up with quite the array of contraptions, each of which gives useful effects. But his gizmos are also fragile and don’t last very long–and they can be attacked as though they were players! He’s interesting to play, and interesting to play against, and we think you’ll really like him. We expect Wrench to ship around early May. What if I already have SlugCrew Points? For those of you who already have some SlugCrew Points under your belt, here’s how point accrual will work. For earning 2014 rewards, we will simply count the points you’ve earned since your last reward. So that means some of you have already earned your Minor Reward for 2014! 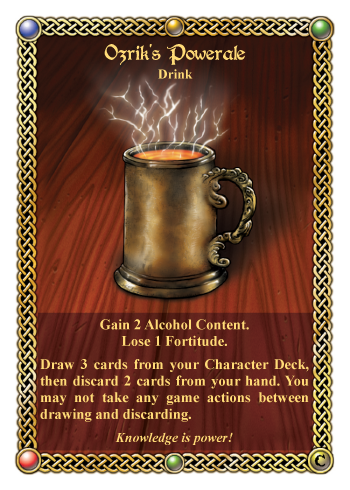 So, TL;DR: new promo drinks, new SlugCrew Ally, get out there and run some demos! If you have any questions or comments, contact us. Thanks, everyone! Will Ozrik be available to the public this year? SlugFest Games - Who Let the Kobold Into the Inn! ?